Go here to subscribe and stay bear-aware. Welcome to Bearmageddon, from Axe Cop co-creator Ethan Nicolle. What started as an online graphic novel has become something larger and more unwieldy than anyone could have imagined, just like a mutant bear. Let me break it down for you. I started creating mock Bear Safety Tips as a companion to Bearmageddon so that I could put something out there that drew attention to my work. Something shareable and easy to digest. The hard part about doing an ongoing webcomic is the deeper in it gets, the harder it is to get anyone to try it out. That requires word of mouth, advertising campaigns, and money. My safety tips were created as an experiment to share things not from the comic, but within the same sphere. These memes and satiric news stories took on a life of their own and have gone viral many times. You can see more of those at BearmageddonNews.com. When Wow Mart employee, Joel Morley, and his slacker friends ditch society to live in the forest, they discover a mass exodus of bears heading back to civilization to declare war on mankind. They enlist the help of a half-feral mountain man named Dickinson Killdeer to aid them in returning to the city to find their families. But With bears mutating, growing tentacles and invading in massive numbers, it looks like the end of civilization as we know it. Not yet. After collecting volume 1 into a trade paperback, I attempted to self-publish using Amazon CreateSpace, but the prices and quality were not what I had envisioned for the book. I have not found a suitable publisher yet, and though I have considered doing a Kickstarter to make a book, I haven’t pulled the trigger on one yet. 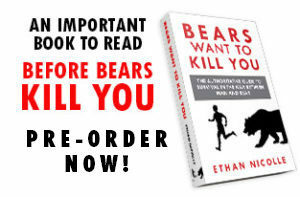 If you are interested in publishing Bearmageddon, contact me, I’d love to talk. I’ve split the book into two volumes so far. When you reach the end of the free sample online, I offer various ways to get the PDF of Volume 1 easily. I am working on the way to unlock the pages on the site, but for now, this is the best way I have found to connect with my readers. If you have any issues getting volume 1, feel free to contact me. My name is Ethan Nicolle. I am best known as the co-creator of Axe Cop. I also did a comic series called Chumble Spuzz that was nominated for an Eisner Award. Besides comics, I worked as a producer, writer and voice actor on the Axe Cop TV series on FOX and FXX, writer and story editor on Dreamworks’ VeggiTales in the House, and have written for other shows such as Teen Titans Go! and Bunnicula for Warner Brothers. Bearmageddon was one of those ideas that came to me, and I had to draw it. A story about bears taking over the world isn’t exactly new, but it’s a concept I felt I had a unique take on. Where most people would make it into a straight joke or parody, I saw something bigger. I saw camp sci-fi, action, horror, comedy and real drama. A story about more than just bears killing people. A story about manliness. After all, what is more manly than fighting a bear? And what generation has questioned the concept and validity of manliness more than ours? There is a manliness question we all struggle with if we were born boys. Bearmageddon is my ridiculous and fun struggle with that question. What Are the Plans For Bearmageddon? If I had a billion dollars, I’d make the most epic comedy/disaster/horror film ever made, but for now, I am making this comic one page at a time. I started writing Bearmageddon in 2009, then began to draw it in 2010. When I was about 20 pages into drawing the book, my side project Axe Cop, a comic I made with my five-year-old brother, went viral and sort of took over my life. I shelved Bearmageddon for a year and drew a lot of Axe Cop. One year later, even though Axe Cop was still on the rise and getting a TV series, I didn’t want it to be the only thing I had going, so I decided to put Bearmageddon.com up and began posting pages regularly. I have had to take a couple of hiatuses along the way, especially back when I was wedding planning and getting married in 2012. But since 2010 I have produced over 200 pages of Bearmageddon and offered them all free online. My goal with the story is to reach the end. I have a rough draft script of the entire story written. The story I have planned will fill three volumes in my estimation. It’s a big story that starts tiny and continues to scale up. Does that mean Bearmageddon is finite and will end one day? Maybe. I have a sequel in mind. Thanks! Me too! The best way to get more Bearmageddon is to support it on Patreon. If I get enough support, I will up my page output. The other way is to share this site and anything Bearmageddon related with your friends, vote for it on TopWebcomics.com and review it on Amazon.